Mr Bhatia is a Consultant Orthopaedic Surgeon at Leicester General Hospital with a private practice at Nuffield Health Leicester Hospital. Mr Bhatia specialises in foot and ankle surgery including bunion surgery, failed bunion surgery, lesser toe deformity correction, hallux rigidus, morton's neuroma, rheumatoid foot reconstruction, arthroscopy of the ankle, sports injuries (ankle stability), deformity correction, midfoot and hindfoot fusions, arthroscopic ankle fusion, achilles, peroneal, tibialis posterior tendon disorders and ankle replacement. Mr Bhatia was recently selected for the prestigious European Foot and Ankle Society's annual visiting fellowship in the USA. Mr Bhatia visited Dallas, Charlotte and Rochester. 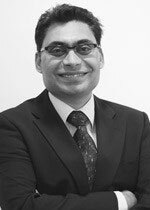 Mr Bhatia's research interests include minimally invasive achilles tendon repair, hallux valgus, failed bunion surgery, Morton's neuroma, rheumatoid foot and hallux rigidus. Mr Maneesh Bhatia does not hold a share or financial interest in this hospital, another Nuffield Health hospital or the company. Mr Maneesh Bhatia has the following interest in equipment used at this hospital or another Nuffield Health hospital: Mr Maneesh Bhatia owns 100% of a Shockwave Therapy machine which is located at Nuffield Health Leicester Hospital. Mr Maneesh Bhatia does not hold any paid advisory role(s) at this hospital or on behalf of Nuffield Health.